This online tool provides a dynamic, user-friendly interface in which hotel clients planning groups events like meetings or weddings can visualize their meeting rooms in three dimensional details. The first Design Hotel in Montreal and in Canada, the St Paul Hotel,adds another first with the FastBooking 3D Meeting Planner in the reservation section of its website. An optional module of the FastBooking Engine, the industry’s most powerful booking engine, the FastBooking 3D Meeting Planner is a powerful interactive sales tool which allows hoteliers to highlight their meeting rooms’ strategic advantages. FastBooking 3D Meeting Planner presents interactive meeting room floor plans and capacities, which help users select different room configurations as well as view all the essential equipment required for planning their meetings (projectors, screens, outlets, Internet network, speakers, natural lighting, etc.). Descriptions and photo galleries highlight important details and clarify each room’s ambiance. These Internet pages with flash applications are designed specifically to meet the hotel’s website graphic guidelines and integrate completely with the hotel’s Web site for a better user experience. 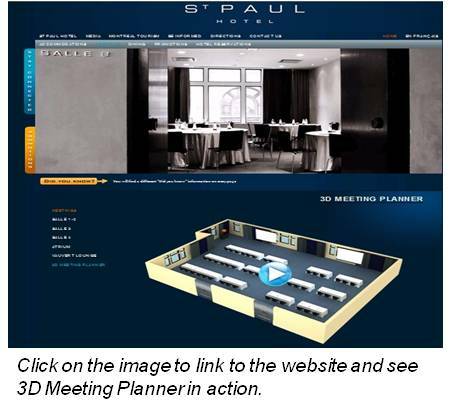 “There are two reasons we chose to add FastBooking’s 3D Meeting Planner,” says Thaddee Biegala, Director of E-commerce at the St Paul Hotel. “This tool is tremendously powerful. Meeting planners can see exactly how the room configures for their needs. They can make their decision on the spot and reserve immediately. It’s a huge aide for increasing the conversion rate on the website,” says Richard Kefs, FastBooking Chief Executive Officer. According to Thaddée Biegala, FastBooking 3D Meeting Planner revolutionizes the way the hotel’s clients organize their meetings with the property. “I’m someone very demanding and I expect the best of my partnerships. I have to say that Fastbooking has exceeded my expectations. They have created my meeting rooms in detail as I’ve asked them to. And I am very pleased with what we have now,” he adds.